Deputy Speaker Aide Ganasi today announced in his opening remarks that the notice for a motion for a vote of no confidence against the Prime Minister and Govt was rejected by the Permanent Parliamentary Committee on Private Business this morning. The Speaker said the main reason being that several MP’s denied signing the motion and that a Member who also signed was suspended in support of the motion is awaiting court proceedings. “The Committee also established that the Member for Vanimo Green, Belden NAMAH is currently suspected by law from exercising his duties and functions as a Member of Parliament irrespective of his Supreme Court Appeal,” said the Acting Speaker. 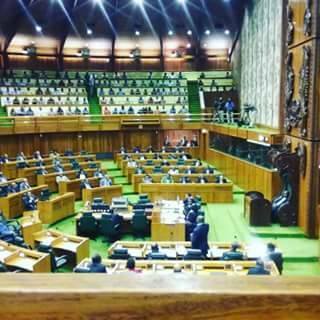 The Acting Speaker also said the committee also established that the Governor for Morobe KELLY NARU, signed three copies of the initial motion submitted on 3rd of November 2015 nut did not sign or support the current Motion dated 22 March 2016. “Instead a copy of the initial motion was used and submitted with the attachment of the initial signatures even though the Member had not indicated his support of the current proposed motion,” added Mr Ganasi. The Committee further established that on the basis that there was inadequate support for the motion, it failed to meet the minimum requirements as required by Section 145 of the Constitution. Points of Order from Opposition’s Dr Allen Marat, Sam Basil and Leader Don Polye were not entertained by the Chair. Further to this the Parliamentary Committee has sought advice and has decided to refer Deputy Opposition Leader Sam Basil to the Parliamentary Privilege Committee for the breach of Parliamentary Procedure.